JRebel 6.2 adds more support for TomEE. Traditionally TomEE support has relied on our regular Tomcat support and now TomEE is its own first-class platform. All flavors of TomEE are supported: TomEE Web Profile through PluME. 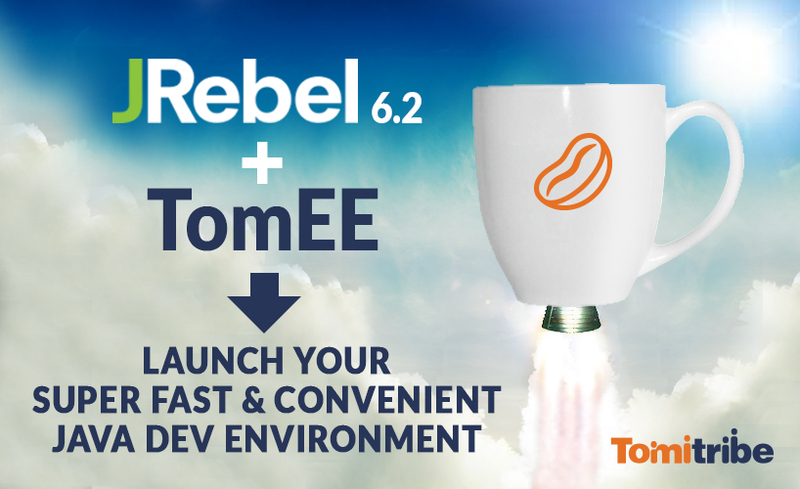 Keep reading to see how you can leverage the awesome power of TomEE and get the productivity boost from JRebel! JRebel is a developer’s productivity tool. JRebel allows developers to reload code changes instantly. It skips the rebuild, restart, and redeploy cycle intrinsic in Java development. This enables developers to get more done in the same amount of time and stay in the flow while coding. JRebel supports a majority of real-world enterprise java stacks and is easy to install into existing development environments. The average Java developer wastes one full work month per year waiting for builds and redeploys. That number comes from an average across application servers and servlet containers; some developers spend only a matter of seconds and others an hour or more each time they want to see a code change during development. With JRebel, developers can make changes to their apps and reload the code in the JVM instantly, including framework code (over 90 supported) like Java EE and Spring! TomEE is a great way to write apps and leverage Java EE without having to run a heavy container. You can keep using Tomcat’s lightweight, yet powerful, servlet container with TomEE, which comes bundled with the best Open Source implementations of Java EE specifications. It’s also fully backed by Tomitribe with enterprise services and support. Combine the speed of Tomcat, the enterprise-class features of Java EE, and the class reloading power of JRebel and you’ve got the most productive, lightweight, and convenient Java development environment on the planet! Traditionally, without proper class reloading, you would have to use HotSwap or a hot deploy to make a code change to your application. HotSwap is great if you are only making method body changes and do not use any frameworks, including Java EE. A hot deploy would be okay, except you lose state in the application and have to wait for the application to reinitialize in the runtime, a non-trivial time sink. While TomEE may be lighter in weight and faster than traditional Java EE application servers, the bulk of the time spent on a redeploy is actually reinitializing the application and recreating the application’s state. JRebel enables you to make changes to your application; whether it’s normal Java code, static content, non-Java files (like pictures, CSS, HTML), or framework code and it will be reloaded instantly into the JVM. Reloading code, instead of redeploying, means that you can keep in the flow and not worry about your tooling or build process. You will enjoy a more natural coding experience. That’s cool, but how do I get it? JRebel is available in the Eclipse marketplace, IntelliJ, and Netbeans plugin directories. You can also get a free 15-day trial of JRebel at http://zeroturnaround.com/software/jrebel/trial or read more about JRebel at http://zeroturnaround.com/software/jrebel/. All versions of TomEE (Web Profile, JAX-RS, Plus or PluME) are available for download at http://tomee.apache.org/apache-tomee.html. To get a running start, here are some quick tutorials on getting started with TomEE: http://www.tomitribe.com/resources/tutorials/. Then it’s just a couple of quick ‘check the boxes’ and you’re on your way! Next PostWebSocket and Lock It!